What is Analytics User Explorer, and how useful is the data? Along with many other impressive announcements recently, Google has been busy providing users some interesting new features to enhance its already invaluable analytics platform. I must admit, my favourite change that has been introduced recently (not for analytics) is the ability to aggregate and group search console data using property sets. I think this will help marketers understand the relationship and behavioural differences across multiple platforms and better make decisions about CC TLDs and mobile app marketing. If you get the chance, I suggest you take a further read. For now, though, lets talk about another addition to Google’s growing list of awesome tools to help us marketers become more accurate. Let’s investigate Google Analytics User Explorer. This new feature, aptly named ‘User Explorer’ has been rolling out slowly since March 2016, and offers website owners the opportunity to view some very granular visitor interaction data across your entire website. The data is grouped by a unique user ID and includes page views, goal completions, commerce transactions and events combined and specific to each anonymous user. User Explorer is a new set of reporting in Google Analytics that allows customers to anonymously analyse individual interactions to their website. User Explorer utilizes your existing anonymous Google Analytics data to deliver incremental insights [and] helps marketers obtain valuable insights need to improve and optimize their site. The feature is now available in the Audience sections. Anonymous Client ID and User ID will be surfaced in this report as a part of the release. On viewing User Explorer, the page shows a list of client IDs, accompanied by basic data including sessions, average session duration, bounce rate, revenue, transactions and goal conversion rate. You can click through to each individual report, where you’ll see the user’s detailed activity history and the time of each site interaction. You can filter this data to show only viewed content, goal completions, transactions and events. How do you set up user explorer? When you click through, you’ll see the acquisition date and channel for the user, along with an activity log that details which actions the user took on your site during each session (including multiple sessions). What data does user explorer offer that other GA features don’t? This is where User Explorer allows you to become creative; making sense of the data and what it can teach you. The User Explorer report lets you isolate and examine the behaviour of individuals (and sub-sets of users) rather than the aggregate user behaviour. Typically, working in search marketing means that understanding and managing large sets of aggregate data and behaviour is important and always has been. For example, you may look at a number of pages defined by a certain metric, such as ‘pages with a high bounce rate’. Understanding individual behaviour takes this one step further and allows you to try and personalise the user experience, based on particular pressure points. Such as, common themes occurring when users abandon carts, or leave your site. How about defining common actions that take place after a micro goal conversion? Do users continue their journey after signing up as a user, do they make a purchase, or do they leave and come back later? Are users that watch a video more likely to convert or do they change behaviour after watching a video? All of this data can be used as insight when attempting to influence the quality of users and how they navigate through your website. Patterns may start to emerge as you sift deeper through this data. This data becomes particularly useful if you need to gain insight into or improve a specific user experience. For example, you may find that users acquired through a particular channel only view a small number of pages and don’t complete a desired goal or conversion. Can this journey be improved, and over time do you see more users converting using this path? The possibilities become very detailed. With User Explorer, the aim has to be to analyse micro trends in your data. Finding common denominators. Using analytics in its traditional format, you can make educated changes looking at batches of pages with a particular subset of data or metric. For example, pages with a high bounce or pages with a high exit rate. Typically, you’d then aim to improve those metrics by making refinements and changes across those pages. With user explorer, the door opens to a completely new set of data. Exploring by unique user enable a truer representative of what common points during a customer lifecycle impact overall website performance. You may find that most of your users actually complete a goal on their third visit. How can that be improved or reduced to two visits? What pages are they viewing during each session? Which key pages have they not found sooner in their journey, and which pages don’t provide the right level of information? All of these questions can begin to be looked at in more detail, helping users to become more efficient. Remember, the important generation Z users expect instantaneous results and the ability to make quick, hassle-free decisions. You can also look at how long users spend between each visit. Do they come back the next day? Do they come back the same day? Do they not come back at all? Tailor site content to black and white user behaviours, not just single batches of metrics. 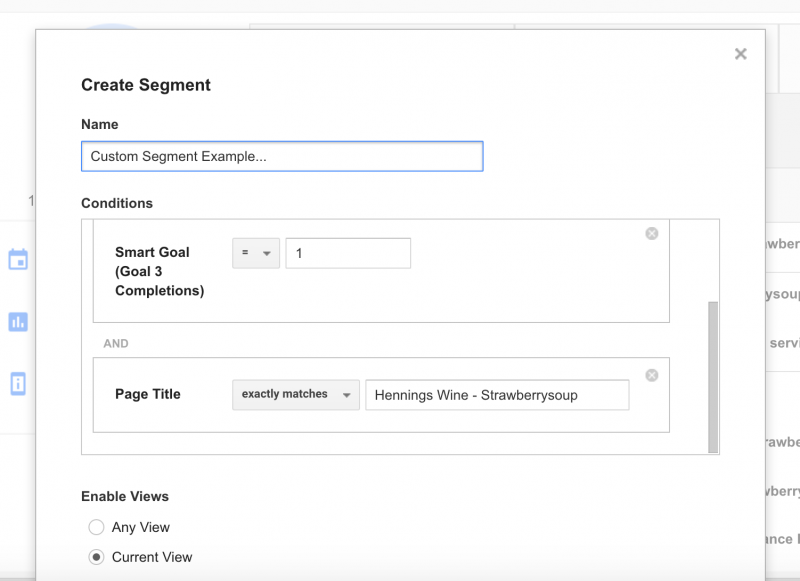 Like the rest of analytics, you can create segments in User Explorer, based on a combination of actions that a particular set of users engaged in. That segment can then be applied to the entire report for analysis. Analysis a set of users that took similar actions on your site. You can apply only user-based segments to this report, and you can apply only one segment at a time. Simply select the actions you want to define as a segment (using tick boxes), and segment builder will open, where you can name the segment, modify conditions and save reports. After you apply the segment, you’ll see a list of clients that meet those conditions. Google suggests that “If other analytics reports indicate noteworthy behaviour by a particular segment, you can examine specific users within that segment to get a more detailed understanding of what’s happening. For example, if the overview report indicates that a particular age group has an unusually high bounce rate compared to other age groups, you can apply that segment to User Explorer, and then take a look at individual users to see whether they’re bouncing or exiting from the same page or group of pages. As explained earlier, upon closer examination of your site content, it might reveal that certain imagery and copy might work better for different audiences. In this instance, you may want to support different segments with site content that is more relevant to their motivations for buying. If you hope to create or would like to develop existing user personas as part of your marketing, you can now investigate the behaviour of different segments so that those personas are based on how users engage with your site, and not how you envisage they would or should. This information can help to bucket users into different pools by completely fresh data. Not just traditional, age, need or location but by including more detailed information about what pages they view before a conversion, how long they take to make a buying decision and so on. User Explorer is a fantastic new feature, that allows users to be viewed in batches, by certain criteria as opposed to pages by a set of metrics. Data that can be used to better understand common user pitfalls that you may not have categorised together previously. This is another great example of the continued integration between customer experience, search marketing and on site optimisation, providing further a platform for what I think is the now of digital marketing. Search experience optimisation. Find common problems, encountered by real sets of users and alleviate any barriers. Kudos to Google, for giving website owners this great new set of information. Jack Cooper is the Digital Marketing Manager at Strawberrysoup, an integrated Digital Marketing Agency with offices based in Chichester, Bournemouth and London. Strawberrysoup is a flourishing digital agency with its roots based firmly in website development and design and Jack enjoys writing about the relationship between new marketing techniques and the creative industries. Does Brand Blindness still Exist in a Digital World? Was it Marketers that ruined social media? Yes they did.